PC-870 Medium Urethane Reducer has been formulated as a universal comparable product to many paint manufacturers Urethane Reducers. 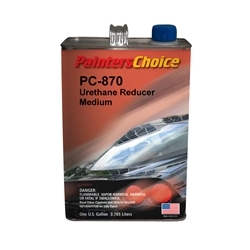 PC-870 Urethane Reducer will improve overall appearance for a smoother basecoat finish and better metallic flake control. This product has been formulated to control cure and flash times as well as improve basecoat and application performance. Use this product in 70° tempertures.